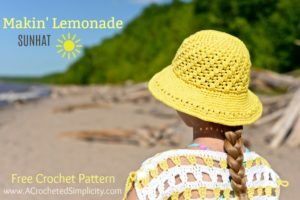 When I caught my first glimpse of Lion Brand’s new tape yarn, Rewind, I knew right away that it would be perfect to make myself a new sunhat and beach bag! 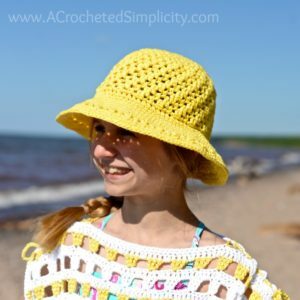 With summer quickly approaching and the sun’s rays getting hotter by the day, I designed the Stop & Rewind Sunhat for myself. After making myself a sunhat Claire asked me to make her one too. Because I seem to have a bad case of crochet-two-itis (I have a hard time making 2 of the same thing…slippers are a challenge 😉 ), I had to come up with a new design for Claire. 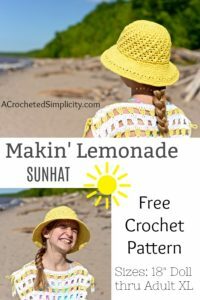 The Makin’ Lemonade Sunhat is similar to the Stop & Rewind Sunhat, except it has a lot more texture on the main body of the hat. The Sunny Days Beach Cover-Up shown in the photo above can be found HERE! Lion Brand Rewind is a polyester/viscose blend. It’s super soft, great to work with, and easy on your hands. It is available in 8 wonderful colors that include brights (perfect for summer fun!) and neutrals (perfect for everyday wear). This yarn is great for a variety of projects ranging from year-round sweaters, shawls, and cowls to various home decor items. It is classified as a Bulky/5 weight yarn, however, I found that while designing my sunhat, it worked up more comparable to a lighter worsted/4 weight yarn. See Linen Stitch Gauge Swatch Instructions below. This hat is worked from the crown down in continuous rounds. The only round you will join w/ a sl st will be your very last round. I highly suggest using a scrap piece of yarn to keep track of your rounds. Yarn Notes & Substitutions: Lion Brand Rewind tape yarn was used for the samples in the pattern. Although it is classified as a 5/bulky yarn because it is a tape yarn, it works up more similarly to a lighter worsted/4. So keep that in mind if you’re looking for substitutions. Testers used worsted weight/4 cotton yarns and their hats worked up beautifully. Lion Brand Rewind yarn is the perfect yarn for this design as I did not need to add wire to the brim to keep its shape. Everything written within the brackets [ to ] is one full repeat. Sometimes you will also have small repeats in parenthesis ( to ) that are written within the [ to ]. Rnd 5 is the first example of this. This is what’s written: Rnd 5: [ (sc, ch 1, sc) in the next st, ch 1, skip the next st, (sc in the next st, ch 1, skip the next st) 3 times ] work from [ to ] 3 times,…. You will work everything from [ to ] as one full repeat. Each repeat is 10 sts. After completing everything within brackets [ to ] 3 times, then you can continue on to complete the rest of the round. 2 Double Crochet Cluster (2 dc-cl): Yo, insert your hook into the next st, yo, pull up a loop, yo, pull through 2 loops, yo, insert your hook into the same st, yo, pull up a loop, yo, pull through 2 loops, yo, pull through all remaining loops. Front Post Single Crochet (fpsc): Insert hook from front to back to front around the post of the designated stitch, yo, pull up a loop, yo, pull thru all loops to complete the stitch. Row 2: Ch 1, sc in the first st, sc in the next ch-1 sp, *ch 1, skip the next sc, sc in the next ch-1 sp, rep from * across to last st, sc in the last st. Turn. Row 3: Ch 1, sc in the first st, *ch 1, skip the next st, sc in the next ch-1 sp, rep from * across to last 2 sts, ch 1, skip the next st, sc in the last st. Turn. Rep Rows 2 – 3. Note: This hat is worked in continuous rounds. Do not join at the end of each round, instead place a stitch marker after the last stitch of the round to keep your place. Move the stitch marker up as you complete each round. Rnd 7: [ (sc, ch 1, sc) in the next ch-1 sp, ch 1, skip the next st, (sc in the next ch-1 sp, ch 1, skip the next st) 5 times ] work from [ to ] around to last ch-1 sp, skip last ch-1 sp. (56 sts not including skipped ch-1 sp here & throughout) Begin next round in ch-1 sp you just skipped. Doll: End crown here. Do not fasten off. Continue below to Body of Hat. Diameter at this point should be 3-1/2″. Baby: End crown here. Do not fasten off. Continue below to Body of Hat. Diameter at this point should be 4-1/2″. Rnd 8: [ (sc, ch 1, sc) in the next ch-1 sp, ch 1, skip the next st, (sc in the next ch-1 sp, ch 1, skip the next st) 6 times ] work from [ to ] around to last ch-1 sp, skip last ch-1 sp. (64 sts) Begin next round in ch-1 sp you just skipped. Toddler: End crown here. Do not fasten off. Continue below to Body of Hat. Diameter at this point should be 5″. Rnd 9: [ (sc, ch 1, sc) in the next ch-1 sp, ch 1, skip the next st, (sc in the next ch-1 sp, ch 1, skip the next st) 7 times ] work from [ to ] around to last ch-1 sp, skip last ch-1 sp. (72 sts) Begin next round in ch-1 sp you just skipped. Child: End crown here. Do not fasten off. Continue below to Body of Hat. Diameter at this point should be 5-1/2″. Rnd 1: [ sc in the next ch-1 sp, ch 1, skip the next st ] work from [ to ] around to last ch-1 sp, skip last ch-1 sp. (56, 56, 64, 72 sts) Begin next round in ch-1 sp you just skipped. Rnd 2: [sc in the next ch-1 sp, ch 1, skip the next st, dc-cl in the next ch-1 sp, ch 1, skip the next st] work from [ to ] around to last ch-1 sp, skip last ch-1 sp. (56, 56, 64, 72 sts) Begin next round in ch-1 sp you just skipped. Do not fasten off. Continue on to the Brim for the size hat you’re making.